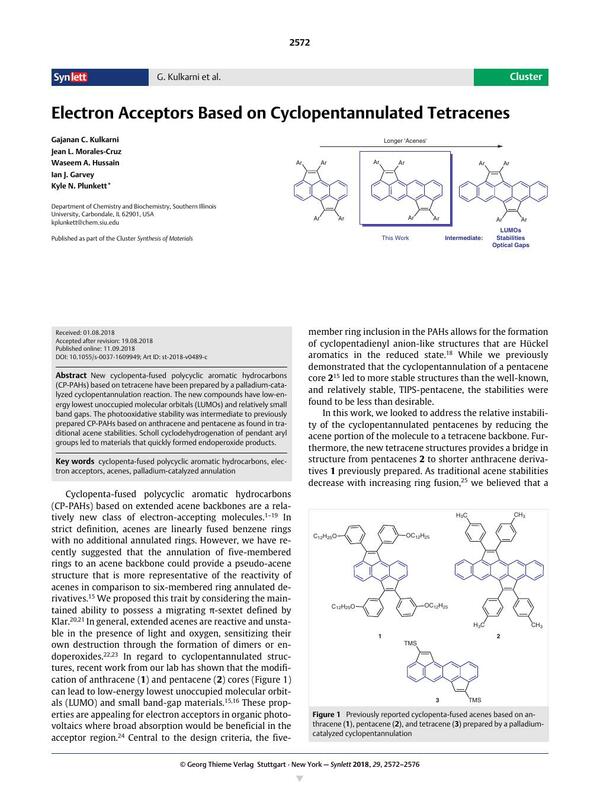 New cyclopenta-fused polycyclic aromatic hydrocarbons (CP-PAHs) based on tetracene have been prepared by a palladium-catalyzed cyclopentannulation reaction. The new compounds have low-energy lowest unoccupied molecular orbitals (LUMOs) and relatively small band gaps. The photooxidative stability was intermediate to previously prepared CP-PAHs based on anthracene and pentacene as found in traditional acene stabilities. Scholl cyclodehydrogenation of pendant aryl groups led to materials that quickly formed endoperoxide products. Supporting information for this article is available online at https://doi.org/10.1055/s-0037-1609949. 24 Wadsworth A. Moser M. Marks A. Little MS. Gasparini N. Brabec CJ. Baran D. McCulloch I. Chem. Soc. Rev. 2018; DOI: DOI: 10.1039/c7cs00892a. 26 1,2,7,8-Tetrakis(3-(dodecyloxy)phenyl)dicyclopenta[de,mn]tetracene (6): In a glove box, 4 (0.127 g, 0.328 mmol), 5 (0.430 g, 0.786 mmol), Pd2(dba)3 (30.0 mg, 0.0328 mmol), P(o-Tol)3 (15.1 mg, 0.0495 mmol), KOAc (0.161 g, 1.64 mmol), LiCl (27.8 mg, 0.657 mmol) and DMF (7.67 mL) were combined in a sealed tube and stirred overnight at 130 °C. The reaction mixture was cooled to room temperature and poured dropwise into methanol (50 mL) and filtered. The solid was washed with methanol and acetone to give 5 (0.164 g, 25.0%) as a green solid. 1H NMR (500 MHz, CD2Cl2): δ = 8.62 (s, 2 H), 7.87 (d, J = 6.5 Hz, 2 H), 7.73 (d, J = 8.5 Hz, 2 H), 7.57 (dd, J = 8.4, 6.6 Hz, 2 H), 7.50 (t, J = 7.7 Hz, 2 H), 7.29 (t, J = 7.9 Hz, 2 H), 7.24 (d, J = 7.4 Hz, 2 H), 7.16 (s, 2 H), 7.13–7.09 (m, 4 H), 6.98 (s, 2 H), 6.84 (dd, J = 8.1, 2.1 Hz, 2 H), 4.00 (t, J = 6.6 Hz, 4 H), 3.83 (t, J = 6.6 Hz, 4 H), 1.80–1.71 (m, 8 H), 1.48–1.19 (m, 72 H), 0.91 (q, J = 7.0 Hz, 12 H). 13C NMR (126 MHz, CD2Cl2): δ = 159.38, 158.92, 141.12, 139.74, 139.39, 136.67, 136.33, 136.08, 131.06, 129.60, 129.00, 128.89, 127.69, 126.93, 126.68, 125.64, 124.20, 122.93, 122.43, 116.58, 115.65, 114.27, 113.69, 68.15, 67.93, 31.93, 31.91, 29.71, 29.65, 29.60, 29.41, 29.38, 29.35, 29.22, 29.16, 26.01, 22.70, 22.68, 13.88. HRMS: m/z calcd for C94H124O4: 1316.9500; found: 1316.9111. 4,4′,4′′,4′′′-(Dicyclopenta[de,mn]tetracene-1,2,7,8-tetrayl)tetrakis(2-methylthiophene) (8): In a glove box, 4 (41.3 mg, 0.107 mmol), 7 (56.0 mg, 0.257 mmol), Pd2(dba)3 (9.80 mg, 0.0107 mmol), P(o-Tol)3 (4.92 mg, 0.0162 mmol), KOAc (52.6 mg, 0.536 mmol), LiCl (9.12 mg, 0.215 mmol) and DMF (10.7 mL) were combined in a sealed tube and stirred overnight at 130 °C. The reaction mixture was cooled to room temperature and poured dropwise into methanol (50 mL) and filtered. The solid was washed with methanol and acetone to give 7 (20.2 mg, 28.3%) as a green solid. 1H NMR (500 MHz, CD2Cl2): δ = 8.47 (s, 2 H), 7.84 (d, J = 6.5 Hz, 2 H), 7.67 (d, J = 8.5 Hz, 2 H), 7.47 (dd, J = 8.4, 6.6 Hz, 2 H), 7.10 (d, J = 1.1 Hz, 2 H), 7.04 (d, J = 1.1 Hz, 2 H), 6.91 (s, 2 H), 6.76 (s, 2 H), 2.59 (s, 6 H), 2.40 (s, 6 H). 13C NMR (126 MHz, CD2Cl2): δ = 140.67, 139.63, 139.20, 137.89, 136.50, 135.69, 135.64, 132.68, 130.89, 128.97, 128.03, 127.55, 126.92, 126.90, 126.34, 125.12, 124.11, 122.34, 121.46, 15.27, 15.09. HRMS: m/z calcd for C42H28S4: 660.1074; found: 659.926.